I received this note this morning. 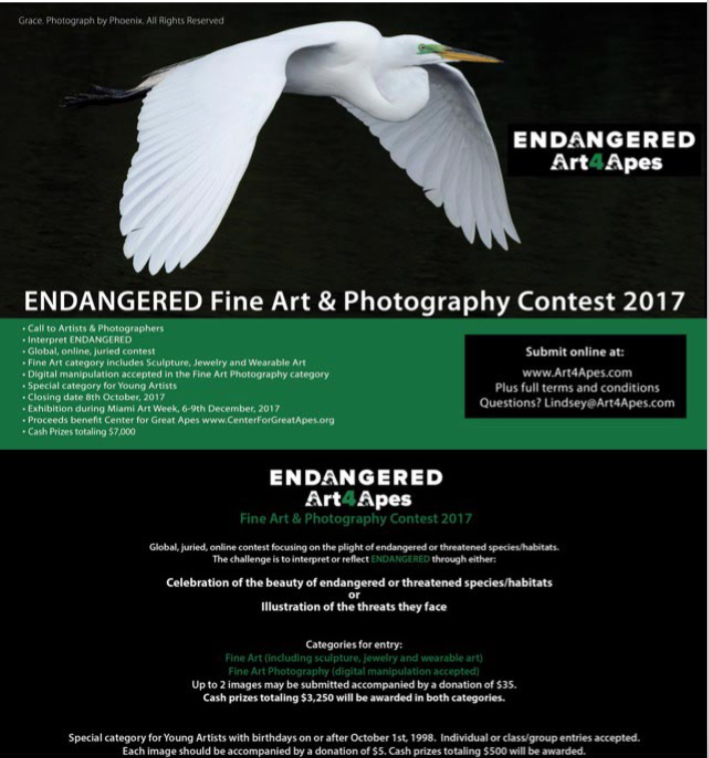 I am writing to let you know about the ENDANGERED Art & Photography Contest 2017. We are keen to encourage more entries in the Fine Art Photography category, which offers $3,250 in prize money. I would be pleased to attach a Call to Artists if you feel it would be appropriate to let your members know about the contest. The rules of the contest are available, in full, on our website Art4Apes.com but I would like to make clear that copyright remains with the artist and we do not use the submitted images for any purpose without the permission of the artist or photographer. We do post the images on social media, but always with the name, title and All Rights Reserved. I would be happy to answer any questions you may have and would be so grateful if you could help us spread the word about the contest.